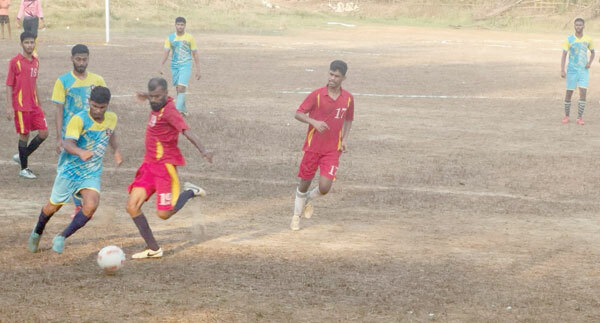 GOA VELHA: Betalbatim Sporting Club scored a solitary goal victory over St. Sebastian Union Club in the inaugural match of the 13th London Trophy organised by Goa Velha Sports Club and played at Goa Velha Sports Club ground, on Saturday. Betalbatim Sporting Club surged ahead in the eighth minute of play through Dylan Rodrigues whose effort from inside the 18 yards box beat the Benaulim keeper. In the second half, St. Sebastian Union Club had a great chance to equalise but Osbourne Fernandes shot wide a free kick awarded just outside the danger area. Another free kick effort from Osbourne Fernandes was punched for a corner by the Betalbatim Sporting Club keeper. St Sebastian UC fumbled with their chances and failed to find the net as their opponents held on to their slender lead.